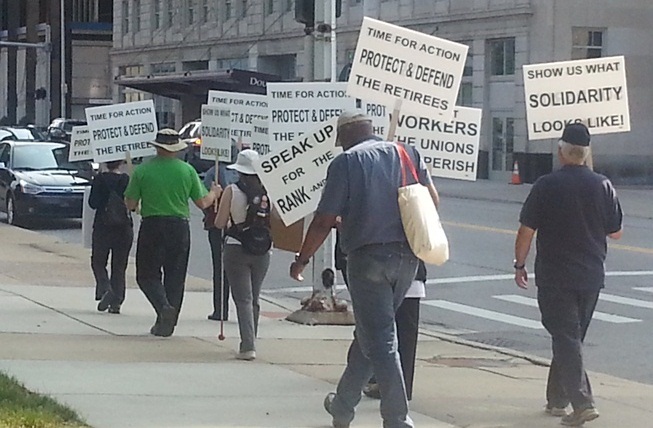 Retirees protest AFSCME’s betrayal on bankruptcy eligibility appeal outside Co 25 headquarters in Detroit July 31, 2014. 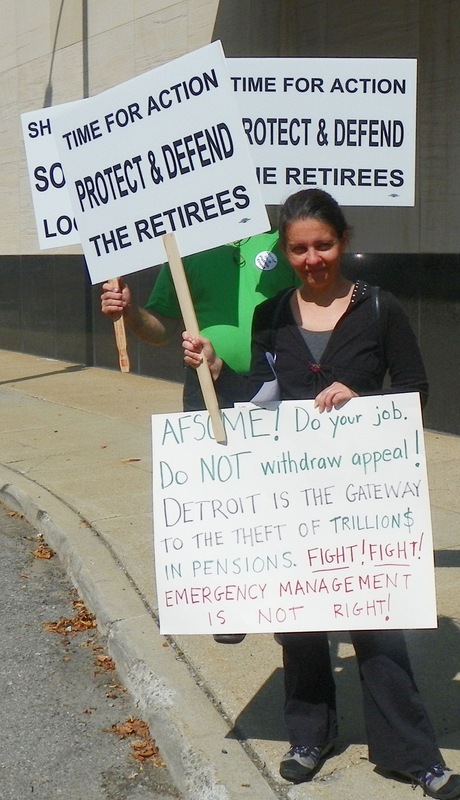 DETROIT – As unions and retirement systems allegedly prepared to retract their Sixth Circuit Court appeals of Detroit’s bankruptcy eligibility today, an impromptu protest at Michigan AFSCME Council 25’s headquarters took place. Al Garrett, Council 25 President, had told VOD yesterday that AFSCME was definitely withdrawing its appeal. 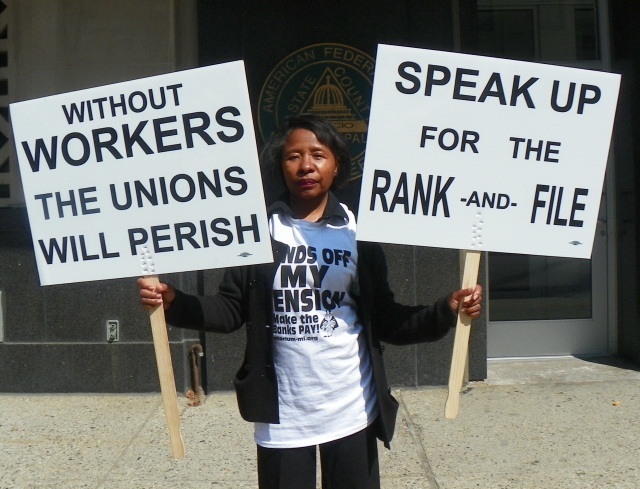 “They just need to uphold the State Constitution, which says that public pensions shall not be impaired,” said AFSCME retiree Ezza Brandon, who has led many protests against Detroit Emergency Manager Kevyn Orr’s declaration of bankruptcy. AFSCME retiree Ezza Brandon stands strong outside union HQ. AFSCME Co. 25 Pres. 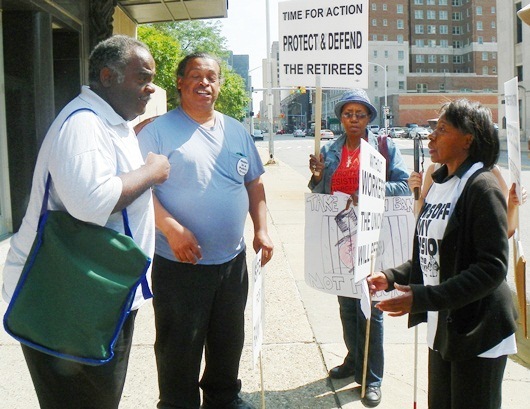 Al Garrett (l) confronts protesters, speaking here with Ezza Brandon (r). Retirees William Davis and Cecily McClellan listen. Garrett tried to defend the AFSCME leadership’s stance, claiming AFSCME alone spent thousands of its money [read dues-paying members’ money] on attorneys to fight the bankruptcy, and that the union got “the best we could.”In fact, the United Auto Workers and the Detroit pension systems, among others, also hired high-priced attorneys, who the protesters said must have given equally rotten advice for the money they got. Garrett said, “Unless something changes, the appeal will be withdrawn.” Sixth Circuit Court of Appeals Judge Ruth Gibbons gave appellants until the end of today, July 31 at midnight to decide. Regarding state constitutional protections of public pensions, Garrett said attorneys advised the union that a court challenge would be uncertain and that the union considers that issue no longer valid. Virginia Williams, a UAW retiree from Ford Motor Company, said, “It’s happening to thousands and thousands of workers everywhere. Where is our union leadership’s compassion, why aren’t they fighting? How are the unions even going to survive if they don’t stand up? Do they suddenly have a ‘new purpose’ for existing?”She said UAW retiree health care benefits have been cut like those for city workers, after they gave up concessions supposedly to help the Big Three auto companies survive. Jean Vortkamp, who initiated the protest although she is not herself a city retiree, said her family members are friends are. Jean Vortkamp at protest outside AFSCME HQ July 31, 2014. A State of Michigan retiree from Auburn Hills who came said, “If they get away with it with City of Detroit workers, they can attack the rest of us as well. William Davis, who worked in the Detroit Water & Sewerage Department, said he stands to lose $142,000 from his annuity savings under the plan of adjustment. He raised the massive privatization plans being worked out during the bankruptcy mediation sessions. Privatization plans for the city’s Municipal Parking Department were just raised today as well. Ongoing privatization will essentially gut the retirement systems. “I signed that because my boss told me to,” Garrett said. “Plus the workers wanted it.” In fact, DIA workers fought the privatization of their jobs and the resultant dramatic cuts in their salaries afterwards. Protesters said McNeil earlier came out to confront them, but that when they tried to raise their concerns to him, he would not listen. The late Leamon Wilson, Pres. of AFSCME Local 312. Note from VOD: Detroit public sanitation and bus mechanic workers first were organized by the United Public Workers Union in the 1940’s. It had militant, radical leadership. But the AFL-CIO, aided by AFSCME, ran the UPWU out because of that leadership. Traces remained, however, in Local 26 in the 1970’s, when Pres. Cornelius Hudson would take his sanitation workers out at the drop of a hat, shutting down the city. The late Pres. 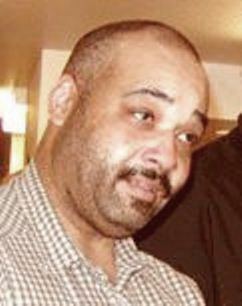 Leamon Wilson, of AFSCME Local 312’s bus mechanics, fought until he died at the age of 55 last year for his membership. Such leaders were frequently undermined by top-level union leadership, which is in bed with the bosses in the Democratic Party. New leaders like them must come forward to unseat the “that’s the best we could do” apologists like Garrett and McNeil. Protesters on the march. Photo: Cornell Squires.